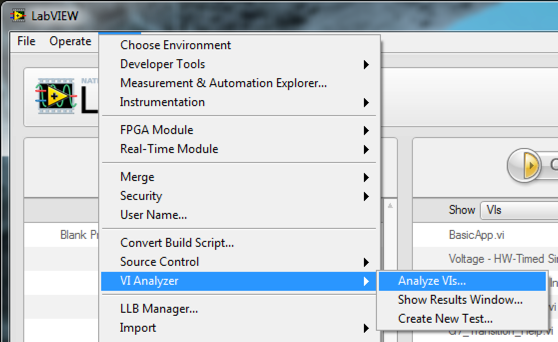 You can use the VI Analyzer Toolkit to review APIs prior to submission for the LabVIEW Tools Network review process. These tests can identify issues with documentation, style, and performance to ensure your LabVIEW code is at the quality level customers expect to find in products listed on the Tools Network. This document contains a tutorial demonstrating how you can use VI Analyzer tests as part of your product review. The test configuration included with the tutorial below is used to automate identification of the following list of LabVIEW Tools Network Style Requirements along with other performance and documentation checks. 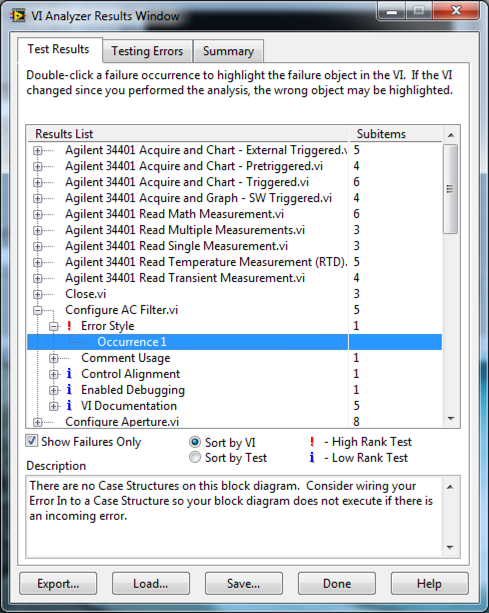 For example, VI Analyzer can check for the use of case structures to handle errors passed through VIs and even perform a spell check of comments and documentation. 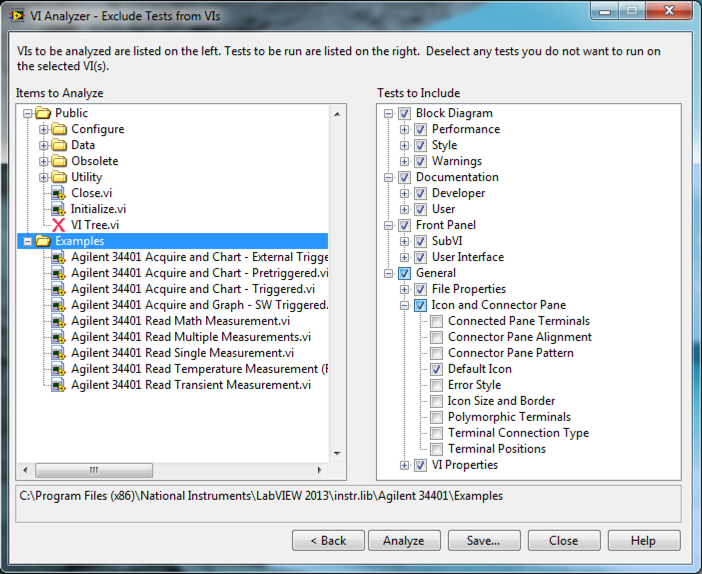 The attached Compatible_with_LabVIEW-Example.cfg file is a sample test configuration for the 'Agilent 34401' API shipped with LabVIEW and found under \instr.lib\Agilent 34401\. You can use this configuration as a starting point for reviewing your APIs. Download the attached Compatible_with_LabVIEW-Example.cfg file. 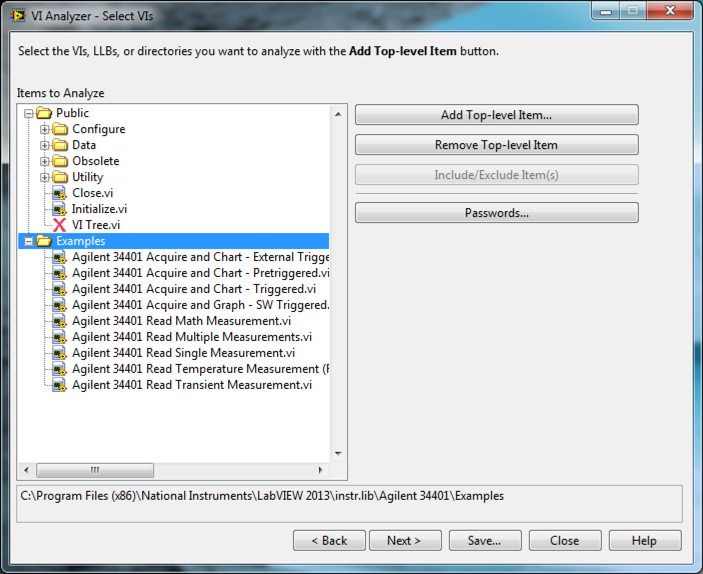 Launch VI Analyzer from the LabVIEW>Tools>VI Analyzer>Analyze VIs... menu entry. Select Load a previously saved analysis configuration file and click Next. Navigate to the Compatible_with_LabVIEW-Example.cfg file downloaded from this page. Review the files included in the Select VIs dialog. These are all customer facing VIs found in either the LabVIEW palette or NI Example Finder. After browsing through the selected test cases, click Next to review the test selection. Here you can configure which tests to apply to your API VIs. For example, example VIs may not need the same connector pane tests as an API VI. Click Analyze to begin test execution. The VI Analyzer Results Window gives you the ability to jump from a test failure entry to the location in your source code by double-clicking on the test entry. In the image below, an API function is not making use of an error case structure to avoid executing code when errors are present. In some cases this is intended behavior (cleaning up a reference) and in others this issue would need to be corrected. 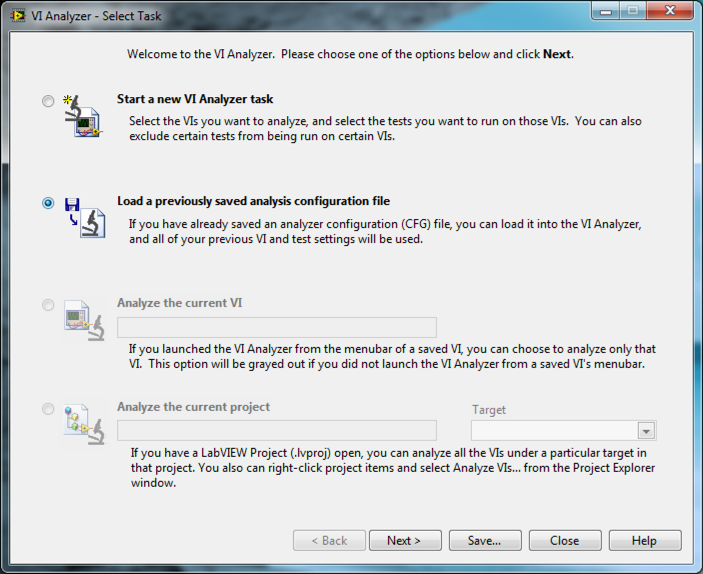 We strongly encourage you to incorporate VI Analyzer testing into your prerelease review process to ensure code is at a high level of quality prior to sending your product or update to the LabVIEW Tools Network team.